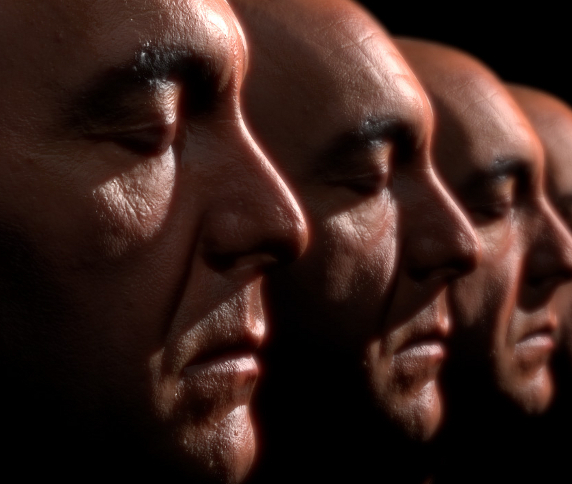 “Unreal Engine 3 features Subsurface Scattering (SSS), and so does CryEngine 3 and Confetti RawK. Specifically, these last two engines are using what is called Screen-Space Subsurface Scattering, an idea we devised for the first book in the GPU Pro series two years ago. Given the importance of human beings in storytelling, the inclusion of some sort of subsurface scattering simulation will be, in my opinion, the next revolution in games. Bear with me and discover why. Let’s start the story from the beginning. What is SSS? Simply put, SSS is a mechanism of the light transport that makes light travel inside of objects. Usually, light rays are reflected from the same point where the light hits the surface. But in translucent objects, which are greatly affected by SSS, light enters the surface, scatters inside of the object, and finally exits all around of the incident point. So making a long story short, light is blurred, giving a soft look to translucent objects: wrinkles and pores are filled with light, creating a less harsh aspect; reddish gradients can be seen on the boundaries between light and shadows; and last, but not at least, light travels through thin slabs like ears or nostrils, coloring them with the bright and warm tones that we quickly associate with translucency. Now you may be thinking, why should I care about this SSS thing? Every year, advances in computer graphics allow offline rendering to get closer to photorealism. In a similar fashion, real-time rendering is evolving, trying to squeeze every resource available to catch up with offline rendering. We all have seen how highly detailed normal maps have improved the realism of character faces. Unfortunately, the usage of such detailed maps, without further attention to light and skin interactions, inevitably leads the characters to fall into the much-dreaded uncanny valley. The next time you see a detailed face in a game, take your time to observe the pores, the wrinkles, the scars, the transition from light to shadows, the overall lighting… Then, ask yourself the following question: is what you see skin… or… maybe a piece of stone? If you manage to abstract the colors and shapes you observe, you will probably agree with me that it resembles a cold statue instead of a soft, warm and translucent face. So, it’s time to take offline SSS techniques and bring them to the real-time realm. This entry was posted in Start and tagged New 3D Skin Technology, New Generation Skin, New Skin, New Skin for 3D on July 17, 2012 by Xpontaneus.